The "Saint Thomas" is one of Spring Air's best sellers in the "Back Supporter" line. It's moderately priced and is a great value - considering the luxury features that it offers to you and/or your partner. 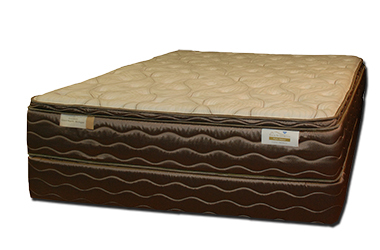 Its Dual Performance Edge Design is one of the best at eliminating motion transfer (example: when someone gets in or out of the bed) and its 800 count Activ-Coil system offers a body-contouring, pressure-relieving sleep surface. 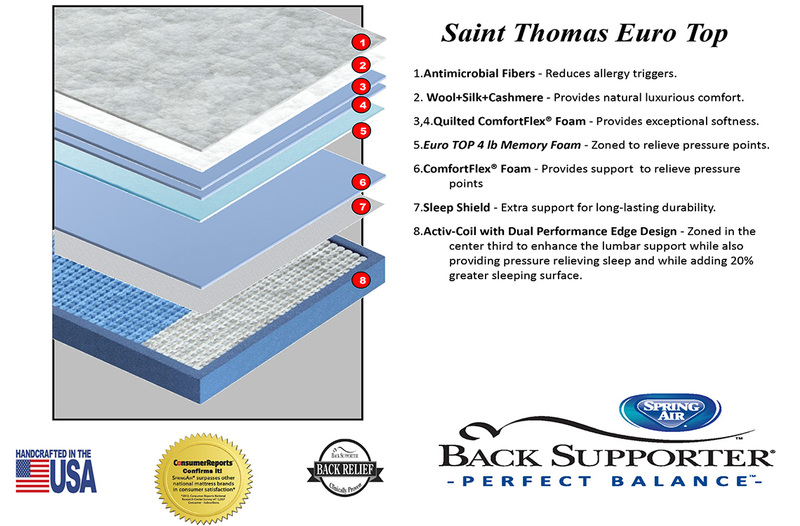 The Euro Top (attached pillow top design) includes a layer of visco-elastic memory foam and adds even more overall comfort to your sleep experience. The wool/silk/cashmere cover is anti-microbial and therefore, is a solid choice for those who suffer from allergies. This is a great model for people who sleep in any position but definitely offers a better rest for side-sleepers than many other mattresses do. A very respected name, great technology, and quality craftsmanship come together to create one of our best offerings of a medium-plush mattress, at a relatively low price. Individual Pocket Coil Springs offer much better motion isolation than traditional springs and will also better flex to your body shape. Shipping or delivery of this item to most areas within the 48 contiguous states only. We cannot offer delivery of this item to Alaska, Hawaii, US Territories or APO/FPO addresses without added charges. Please call customer service for rates and availability. Nationwide and "free" rates are valid to most cities in the continental US. Destination must be accessible by large truck. Some locations may have a small surcharge.